Used cell phones need to be properly disposed of. Old cell phone batteries pose a threat to the environment. Don't allow your old cell phones to sit in a drawer losing value. Sell them today! It is estimated that, on the average, American cell phone users replace their old phones every 18 months. There are now about 1 billion used cell phones all over the United States, hidden in drawers and lockers, and all but forgotten by the owners of these phones. Every year, we discard and replace 100 million used cell phones and the sad part is, less than 20 percent of these are recycled or sent back to manufacturers. Our penchant to acquire the latest and most advanced gadgets that technological companies come up with is what has lead us to amass this huge reserve of used obsolescent mobile devices in our homes, offices, and dump sites. Used cell phones are items, more like electronic clutter actually, that we can easily get rid of. Some people have developed the hobby of collecting old mobile phones, tracing the evolution and miniaturization of technology through their collection. Most, however, simply forgot about their old cell phones, as soon as these were replaced by newer models. Others may have thought about removing the electronic waste, but are just too busy to do anything about it. If you're someone who's got old cell phones hidden in drawers, cabinets, or lockers all over your house, here's your chance to get rid of the clutter, once and for all, and be paid for it. 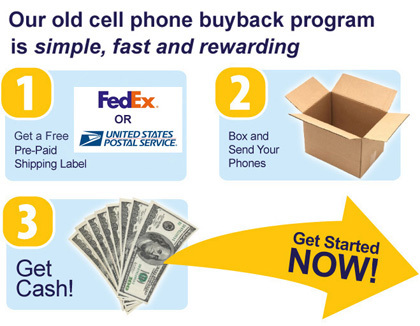 Pacebutler Corporation, one of the principal buyers of used cell phones in the United States, will readily pay as much as $125 for each used cellular phone that you send to us. The price is actually determined by the brand and model of each unit, and, after we received it, the quality. You can find out, before shipping your phones, how much your phones are currently valued by looking at Pacebutler's Purchase Price List. After obtaining the purchase price information, you can now proceed to request for and print out the free mailing label. Naturally, we pay for your shipping costs, and you can choose which of our two shippers - FedEx or the US Postal Service - works best for you. There's no limit to the number of old mobile phones that you can send us and our accounting office regularly cuts checks within 2 business after we've received your phones. Our business model at Pacebutler hinges on two things: convenience for our customers and environmental protection. We believe in providing you with the fairest valuation of your used cell phones through a simple, easy, and convenient system, as described above. We're also guided by the knowledge that the proper disposal of used mobile devices, either by reuse or by recycling, is extremely beneficial to the environment. All used mobile phones may contain varying traces of dangerous chemicals and metals, like mercury, arsenic, cadmium, etc., and that they can present a serious threat to the environment and to people's health when these devices are disposed of carelessly. Increasingly, we're hearing reports of water and soil contamination in areas near landfills where used electronics have been deposited. If you've been biding your time, waiting for an opportunity to emerge, where you remove the clutter, help the environment, and be compensated fairly for those used cell phones, that opportunity is with Pacebutler Corporation. Sell us your old cell phones today, and make a difference. "I have been using PaceButler for about two two years now and I have nothing but great things to say. Their prices are super competitive, turn-around time for payment processing is very quick, and the customer service is top-notch. I have used other cell phone buying companies before I discovered PaceButler, but they don't even come close."